Well, John is annoyed with Marilyn, so she asked Harvey to talk to him to see if he was coping ok, so Harvey told him that Roo is going through the menopause. Which she isn’t. John told Roo, who was not impressed. All these hurt feelings are causing awful confusion. Holly is still cracking on to Zach. Very strange. Why would she be bothered? Anyway, he has told Nat, who advised him to tell Bianca. He won’t and then Holly will accuse him of molestation and then where will we all be? Hah? Rosie hasn’t told her foster parents she’s up the duff. Has anyone told Mullins? Is he going to jail or anything, like? Or is it all ok once he has left town, like Ruby? 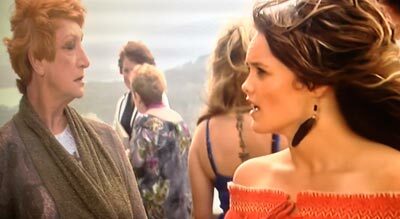 Heath and Brax now know that the joint Casey has allegedly robbed belongs to Adam. This is only confusing them further. Bianca got cross with Heath so he went home, instead of fending off crims. Will she be kidnap victim number 3? Ricky and Brax are getting along great, apart from the fact she won’t tell him anything about herself. Well now we know why…ADAM IS ALIVE and living in her gaff like some class of resurrected Batman baddie. There’s a plot afoot to bring down the Braxtons. Sure, isn’t there always? Indi slept with Chris, for a laugh and to enjoy herself for once. I was sure Romeo would return to catch her in the act. Chris is mad into young Walker, but she’s not looking for anything serious. Dex and April are back together (again). He spoke to Sid about it, saying they were like they had been before his accident. Yet again, no-one mentioned Ruby or has any anger towards her. From the vaults: KISSES HURT SO MUCH!!!!! Well, Leah has a stalker. Brilliant. What’s his story? Maybe someone related to her was involved in his mother’s death? Either way, I’m loving it! Romeo took Dex out for the day, Dex wee’d himself, some girls approached, and Romeo saved the day by firing him into the ocean. Poor Dex. Still no mention of Ruby, who put him in this situation; these people have ridiculous levels of forgiveness. So, Roo and Haaaaavey sorted it all out on the Blaxland. He proposed again, just for good measure. There was a lot of back and forth and it’s-your-fault-not-mine blah blah nonsense, but they came good in the end. Harvey is one of the best names to say in an Aussie accent. Try it there. Let me know if you did in the comments. I’m doing it now. Haaaaaaaaaavey. Dex is sick of being a burden on his family, and on April. His short-term memory is caput, for the minute anyway. Sid has upped his drinking game, by imbibing in the house, not in a ditch. I kind of liked it when he was a knacker-drinking doctor. In the Walker household, there is no mention of Ruby, her sabotage of Indi’s car, or her part in Dex’s injuries. At the very least, they should be going after her for medical expenses. It’s ridiculously (and unbelievably) forgiving of them. Bianca and Heath have decided to live together. They really put the cart before the horse. Bianca’s face when Heath suggested it was gas, it was as if it had never crossed her mind. I hope she is ready for The Boyz calling around with crates of beer, and for Heath running his steroid-selling business out of the house. P.S. Rocco is going to be grand. 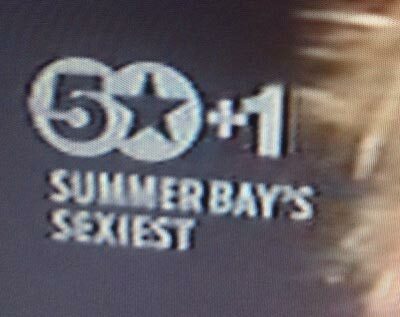 There are romantic disasters a-plenty in Summer Bay at the moment. Harvey went to his ex’s house after he misunderstood the state of his relationship with Roo. Handily, Lottie was at some camp or other. Harvey’s ex seemed to have undergone a personality transplant; she was very giggly and quite nice. Of course, Harvey couldn’t resist the allure of her mild hospitality, and they ended up kissing. Meanwhile, a despondent Roo was phoning him over and over. What a bleedin’ mess. The high point of this episode was an amazing montage in which Romeo dashed into the surf, out of the surf, carried a surfboard, and just started sprinting. Unfortunately, the montage ended in a sickening crunch, which meant he’d only gone and done his knee in again. Dr. Sid was none too impressed. While sitting injured in the Diner, Romeo ran into Indi, who announced that she and Liam were no more. Despite his gammy knee, Romeo got on his high horse and told Indi he couldn’t support her in her break-up, when she’d given up on their marriage so easily. Eh, hello Romeo? What about living and having a pretendy-baby with Ruby? Romeo’s dreams are falling apart in front of his eyes. He went for a walk on the beach with his “best mate” only to be told that he’s carrying on with his ex-wife. Romeo can’t stand the sight of Liam now and is moving out of Leah’s house to show his displeasure. Maybe he can follow Ruby’s road to ruin and go sulk in a van for a while before sabotaging Liam’s motorbike. Tim’s new business venture means that Roo has landed a dream job for herself. The downside is that she’ll have to commute to the city. Harvey is less than impressed about his fiance spending time with her ex. Harvey isn’t very secure in his relationship but Roo wouldn’t do the dirt, would she? Richard wants Jet, but Jet doesn’t want to go to crappy Western Australia. When his Dad turned up at the gaff looking to collect his nipper, Jet had a change of heart and left with his old man. That’s another former crook kid reformed by the redemptive airs of the bay. He can leave town with his head held high. Gina will be heart-broken now, she’ll have to find another pet project. That’s the end of Ruby, everyone was surprisingly nice to her in the end. Hope she has fun in the US. Roo marrying Harvey, why bother? Will Lottie be back for the wedding? Why didn’t the picture get damaged in the car?